Yeah I said it. I actually enjoyed Monday. Whoop De Do! No Honestly, I did. And you wanna know why? Because I had a fabulous weekend and I am just paying it back this week. Today I sat happily in my school office knowing that I didn’t have to go anywhere. I didn’t have to get in my car to drive to anyone’s school to do my pitch. I could sit, happily answering phones or whatever. It was great. Oh and another thing, I had a FABULOUS weekend. This is the Tekking XXL jaywalker I was working on. It will be used as a sample for the shop.This week cannot go by any faster for me so that I can get back to helping more. I hit the stitch gauge on my swatch but not row, but I’ve been assured that this may not be as big of a problem as I think. You know you read some knitting books whose instructions, to me, can sound like my 7th grade teacher, "You MUST NOT run in the hallways"… "You MUST NOT knit your garmet if the gauge is off" it’s like you’re breaking a knitting law. Now, I know there’s much to be studied and planned out with your knit gauge but some of these knit books make it sound like your finish product will be "terrible and make you unhappy for the rest of your life" if you don’t use: A) the yarn suggested B) the needles and C) you don’t hit gauge. I always loved running in the hallways. Also notice that cute little thing that looks like a purse? It’s a PIN CUSHION! My roomate happened to find a vendor that was selling these and thought of me. How great is that!? I love it and am blown away at how thoughtful she was. I guess I should get crackin’ on her scarf! ETA: Also, went to the Stitch Out and had a fabulous time. I mean I got to meet Cara and Mason Dixon KAY (not Ann) Sorry! That’s what I get for being Overly excited and not paying attention! How freakin’ sweet is that!? Beautiful sock, and can’t wait to see your Fiery! Don’t worry about the row gauge. Knit on, friend! 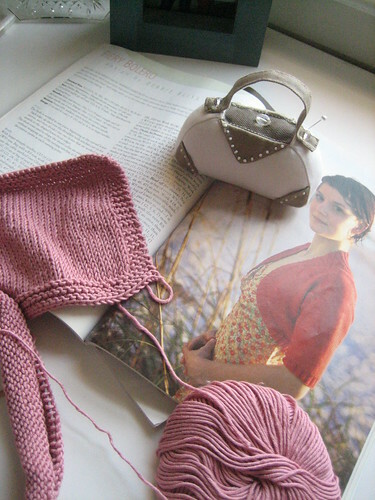 Oh, I just unearthed a skein of Trekking the other night, and thought that I might try the Jaywalkers! It looks great so far! Are you using the 76 stitches? That seems awfully big to me, but I’ll give it a try. I love those Jaywalkers! I never found Trekking all that appealing before but that colorway is really cute & looks great in that pattern. 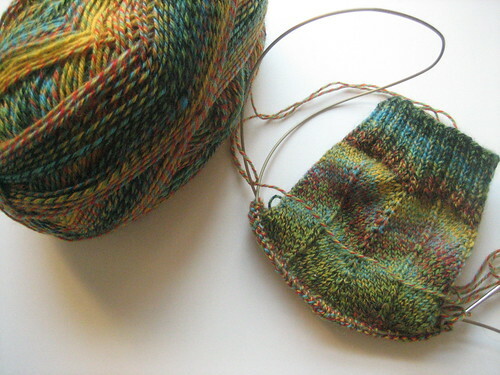 Maybe I’ll give it a chance once I’ve busted my sock stash…months & months from now, probably. love the trekking jaywalker. what colorway is it? I almost never get row gauge, but I adapt the pattern for it. Stitch gauge I think is the more important factor. Love the Trekking Jaywalkers. They’re on my ever growing list of to-dos. Please share the color if you have it. Love your blog!